Healthy Phu My Hung | Hello Saigon! 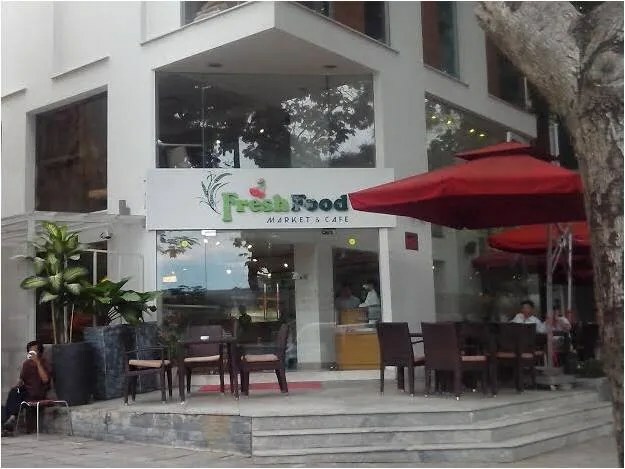 If you like to eat healthy and organic, MSG and chemical free and you live in Phu My Hung, there are lots of options for you to buy food or eat in a restaurant with friends. The neighborhood has more and more healthy businesses each day so we hope this post is a never ending one. Waiting for more businesses to be added so, please, if you know more of these organic places do not hesitate to share with us. I’ll just mention of several places that I know. It would be great to discover more! This shop offers certified organic food. The products sold are grown without pesticides or chemical fertilizers. 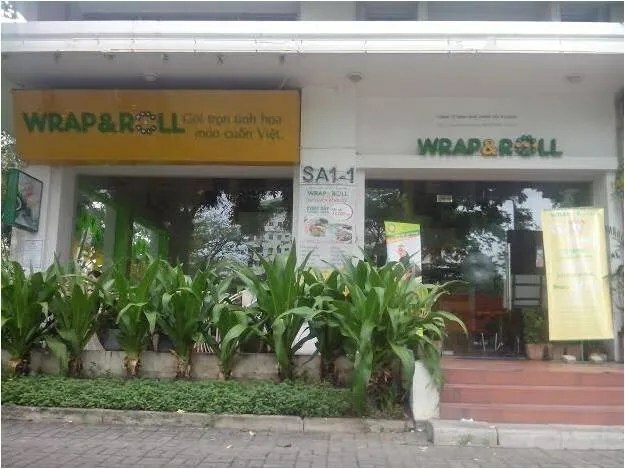 It is a new Vietnamese company born in 2013, with the aim to offer customers a better life through food. It is in the Panorama Building. 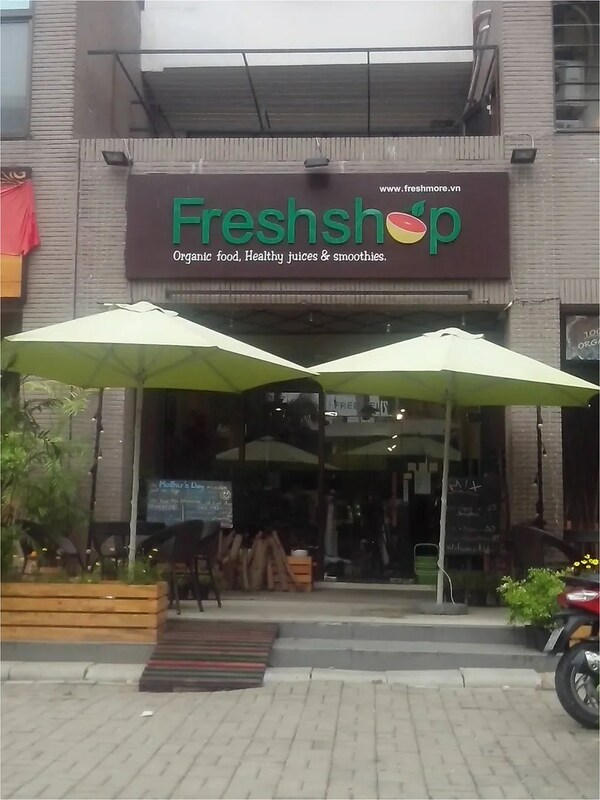 Fresh Shop offers a nice selection of organic vegetables, rice, snacks, as well as healthy juices and smoothies with the best selection of chemical-free fresh fruits. Although it is mainly a healthy juice and smoothies place, this shop also offers a selection of organic fruits. 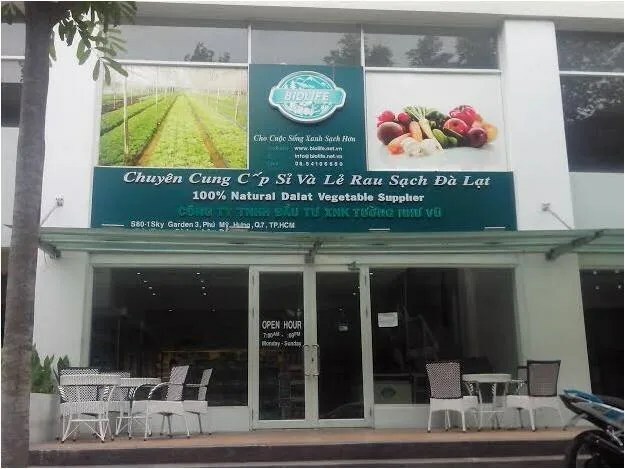 Apart from the one in Nguyễn Đức Cảnh they also have the original newly-renovated shop in Sky Garden 2. 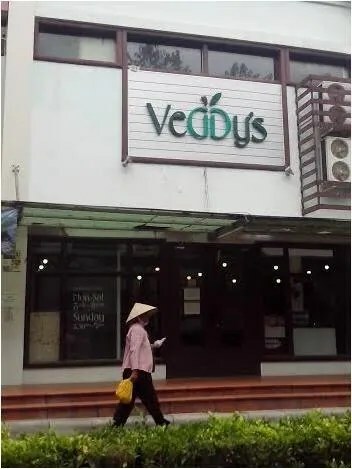 Although a franchise, this Vietnamese restaurant offers the promise of fresh and organic vegetables and the absence of preservatives on their plates. They are certified as a GMO free restaurant. This small shop has a selection of organic fruits, vegetables, and groceries. Check daily their outside blackboard to find the best deals. 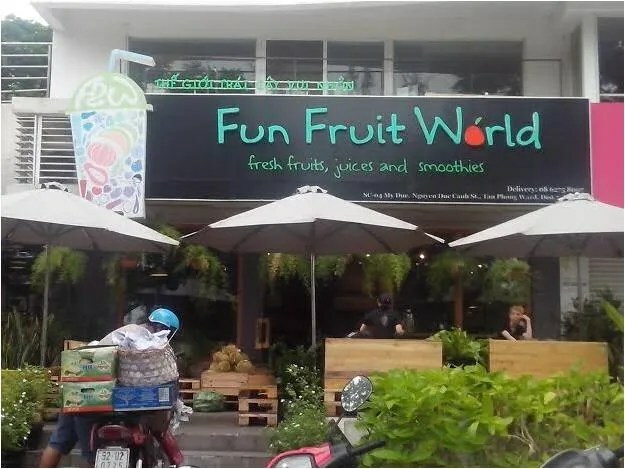 Well known by the expat community in Phu My Hung for its variety of products from all around the world, this market has a selection of fresh and organic fruits and veggies, as well as many healthy grocery options. This small supermarket sells a variety of imported goods as well as some healthy options. Don’t forget to check the big fridge at the back of the shop, it took me a month to know it was there!! This small supermarket has mainly fresh and healthy products from Dalat, organically grown and with the highest quality. They also offer home delivery service. Fresh Food Market and Cafe is an interesting concept, mixing an organic market with a healthy restaurant. The brunch time here is always very busy and for sure, a must try! Lidia is from Spain. After several years working as Spanish editor in a newspaper in New Mexico, USA, she and her family decided to look for a new life. Four months ago they arrive in Saigon. Here she works as an English teacher, as well as, continue freelance writing for several magazines and blogs, both in the USA and Vietnam. Visit her blog Escritora a sueldo. 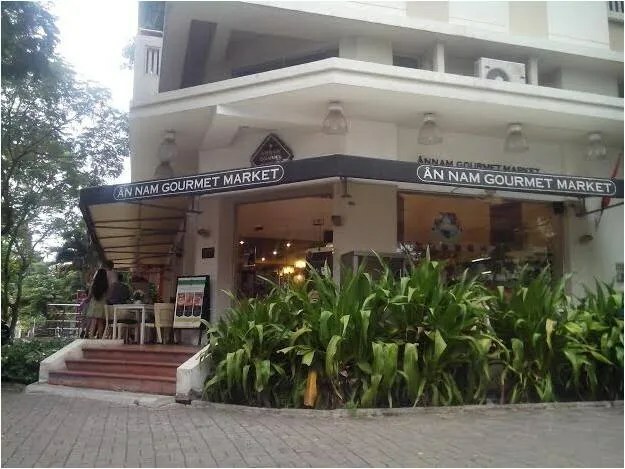 This entry was posted in Exploring Saigon, Gastronomic Delights, Grocery and tagged healthy, Ho Chi Minh City, organic, Phu My Hung, Saigon, Vietnam. Bookmark the permalink. 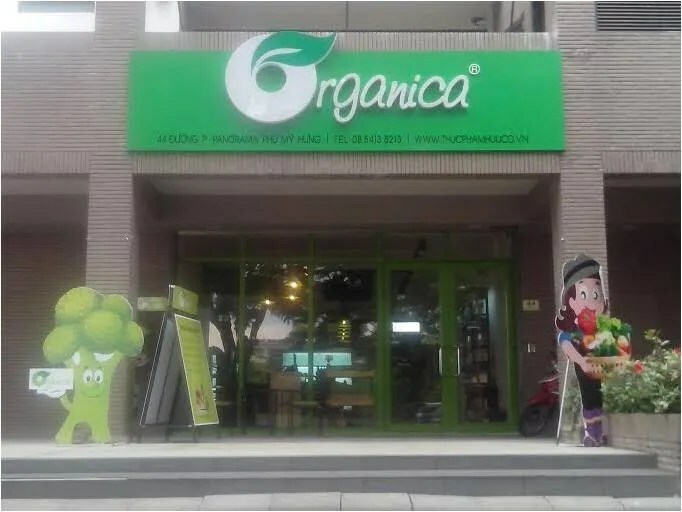 There are so many ‘organic’ shops in HCM, even a couple that claim accreditation with ISO and an organisation in VietNam who the retailers claim have certified their products to meet ‘organic’ standards. I contacted the ISO accreditation agency in HCM and they stated that no store can claim ISO Standards on respect of organic foodstuffs as they have never tested for organic produce. A friend, and I, have followed buyers from some of these ‘organic’ stores and they make purchases, just like any other store, from the wholesale markets dotted around the city. 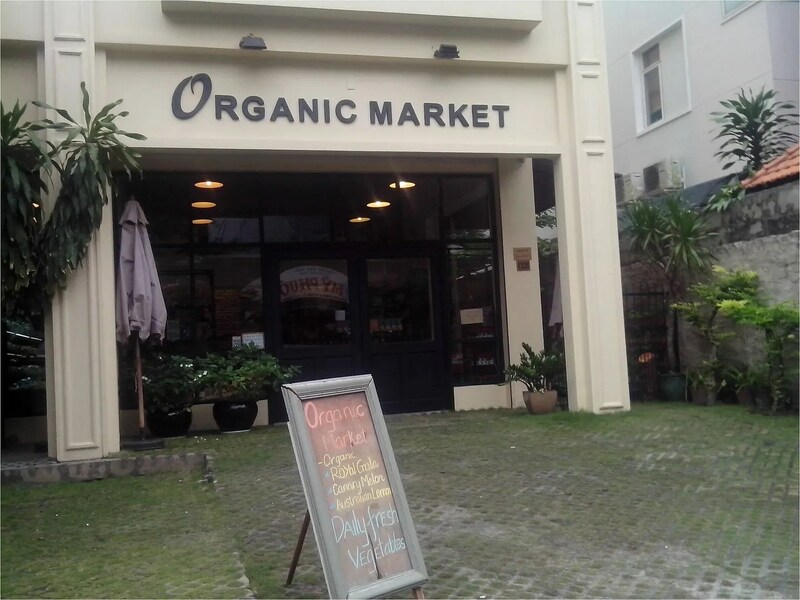 The nearest one to PMH is in Binh Chanh District, not a safe place to be at 03.00H in the morning when the buyers are getting their ‘organic’ supplies. Think about VietNam – all countries use fertilisers but they are expensive. Here, they need economic alternatives. A common one is ‘night soil’. Vegetables are also grown on ‘rafts’ floating in rivers which are filled with yet more ‘night soil’ and manufacturing pollutants. So next time you pay way over the market price, ask yourself what you are actually paying for. You, too, could do what they do. Go to a market, buy the produce, then go to any one of numerous label printers and buy rolls of cute little sticky labels that say Washington Apples, Organic product, etc. Then go back to your store, peel off any labels that say China or have Chinese characters and replace them with your own labels. As they say CAVEAT EMPTOR. P.S. Thanks for the list, we shall check these out next time.